You are here: Home » Blog » Our biggest product to date! At Shephard Building we have taken on some pretty exceptional projects in our time, creating impressive refurbishments and extensions to turn ordinary houses into homes that dreams are made of. Take a look at our biggest product to date and be prepared to be smitten! 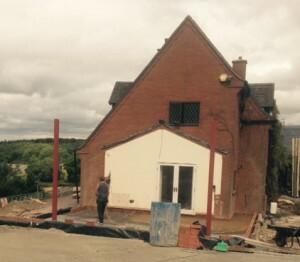 We’re currently constructing a large extension of a farmhouse within the heart of the Charnwood Forest, only a stone’s throw from Bradgate Park. The main aim of this impressive project is to add an enlarged kitchen and master bedroom with en-suite above, but that was really just for starters. Because of the tremendous views which surrounded the property, the design of the extension is focused on taking full advantage of the natural light. So, we will be installing picture windows in both the new kitchen and master bedroom, with 4m wide bi fold doors to the side elevation which will offer a stunning view of Derbyshire. The farmhouse will be in a marvellous position to offer breathtaking views across to Beacon Hill – of course this will mean even more glass and windows of jaw dropping size. We are adding a new state of the art oak staircase to access the first floor with a quadruple Velux roof window combination over the staircase and we’re changing part of the existing first floor to form a new corridor into the new master bedroom. We’re remodelling the existing ground floor of the farmhouse by removing 90% of the internal walls to form a huge living area and dining area, letting the natural light flood through the property. The entire farmhouse will be re-roofed with slate and a new utility room/ground floor WC will be built. The farmhouse will lead to newly converted barns which will become guest bedrooms with en-suites and in front of these will be an oak framed porch to form the main entrance to the property. We will again us a large amount of glass with roof windows for added wow factor. A maintenance free coloured render finish will be given to the exterior of the property, giving the whole build a very modern feel, but the slate roofs mixed in a hint of tradition, with existing parts of the stone work retained. Then there is the jewel in the crown. A short flight of stairs up from the hallway off of the main entrance will lead to a brand new building which will house the private gym. With a 13m x 5.5m full elevation of glass which will overlook the immediate rolling countryside and Beacon Hill, this will be the magnificent icing on the cake. We have years of experience in providing bespoke construction for a range of properties, from the most simple and straight forward home extension, all the way through to the complete property rebuild. We work closely with our clients throughout the project offering them the best in customer service and care from start to finish. If you are looking for an extension, get in touch today to find out more about what we can do for you.